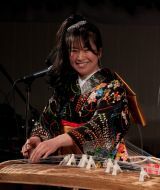 Back by popular demand, the Bowers is proud to once again host Yukiko Matsuyama performing World Pop featuring the Japanese Koto. This Grammy winning musician began studying the traditional koto, the national instrument of Japan, at the age of 9. Her move to Southern California in 1993 and exposure to L.A.’s diverse cultures and rhythms has been eloquently fused into Yukiko’s music today. Just back from Japan, her band features Hirotaka Ogawa, with whom she recorded her CD Beyond the Space. This show marks the official release of the CD in the U.S. and is not to be missed! The instrumentation for the concert will be koto, electric and acoustic guitar, vocals, keyboards, bass and drums. Your evening begins at 5 PM with an exclusive after-hours viewing of the museum’s galleries including the exquisite special exhibition Fabergé: Imperial Jeweler to the Tsars. Be sure to explore our Gallery Store to browse the exotic and unique and receive a 20% discount. Jewelry Trunk Show from 5 PM – 7 PM in the Fluor Gallery with Tamara W. Hill, noted San Francisco-based jewelry designer, featuring her “one of a kind” jewelry designs inspired by ethnic travel and the world’s bazaars. At 6 PM join us in the John M. Lee Court for scrumptious hors d’oeuvres by Tangata* and a cash bar. The program begins at 7 PM in the Norma Kershaw Auditorium. *Tangata will also be open for dinner before and after the event. For reservations please call 714.550.0906.
llan . Last modified Jul 31 2012 7:32 p.m.